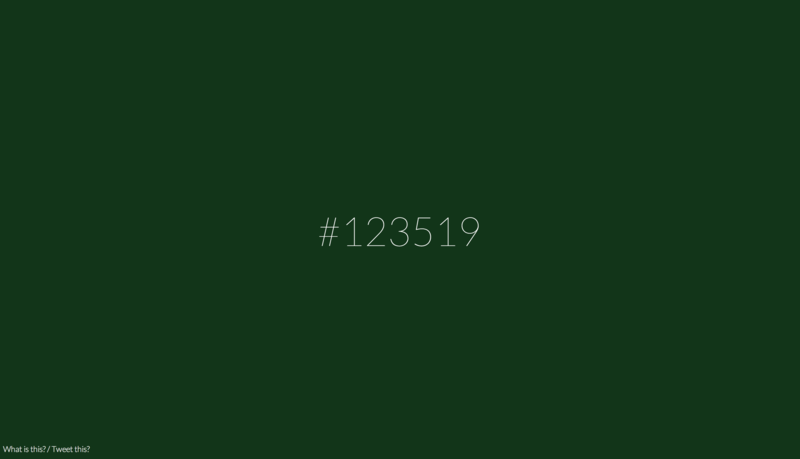 A while back, a developer posted a little experiment in which the current time was being used as an hexadecimal color, applied to the body element. Better have a look at the demo. Making sure the clock is still readable on very dark/light colors. See the Pen Color Clock by Hugo Giraudel (@HugoGiraudel) on CodePen. change font color if too dark/light. Displaying the current time is probably the easiest part of the exercise. Although I must say I got helped by a StackOverflow answer. Let’s tackle the actual challenge. My thought process was as follow. Our time is made of 3 components: hours, minutes and seconds. A color is made of 3 components: red, green and blue channels. If I convert each component to a 255 value, I can have a color from the current time (where hours are converted to red, minutes to green and seconds to blue). Alright. The first thing we need is to compute our color channels based on the current time. To do so, we need a RGBFromDate function that takes an instance of Date, and returns an array of 3 channels expressed as (rounded) numbers between 0 and 255. At this point, we have everything we need to apply the color to the body. Last but not least, we need to find a way to change the font color if the background color is too dark or too light, so the text remains readable at all time. To do this, we have to compute the luminance of a color. If it is higher than .7, then the color is very bright and text should be black.